Never realized that freshly made lemonade and bourbon is a match made in heaven, but it is. It took a complete stranger, who has previously dazzled me and my taste buds to open my eyes to this perfect marriage. Pour bourbon over ice in a tall glass and top off with the lemonade. 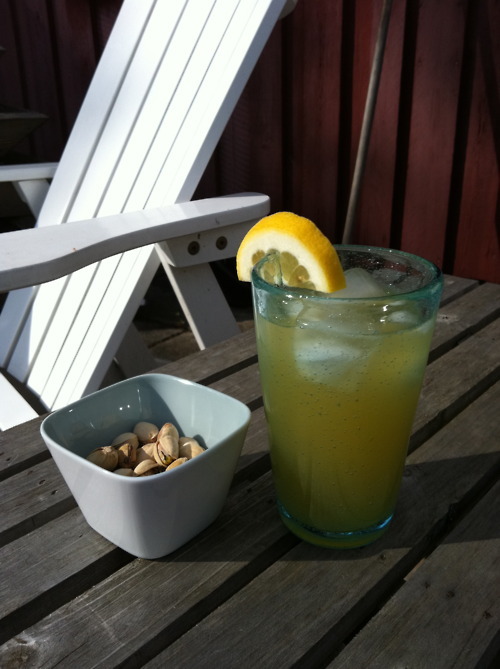 * Homemade lemonade: Juice enough lemons to equal 2,5 dl lemon juice (it's between 6 and 8 lemons worth of juice). Add between 70 ml and 90 ml maple sirup - start slow and keep tasting until you find your preferred balance between sweet and sour. Then add 6 dl of water and put the lemonade in the fridge. Will keep for up to 2 days.